Haute cuisine. Oh, all right then … not. But you can’t really go wrong for NT$50 and an unparalleled ambiance. 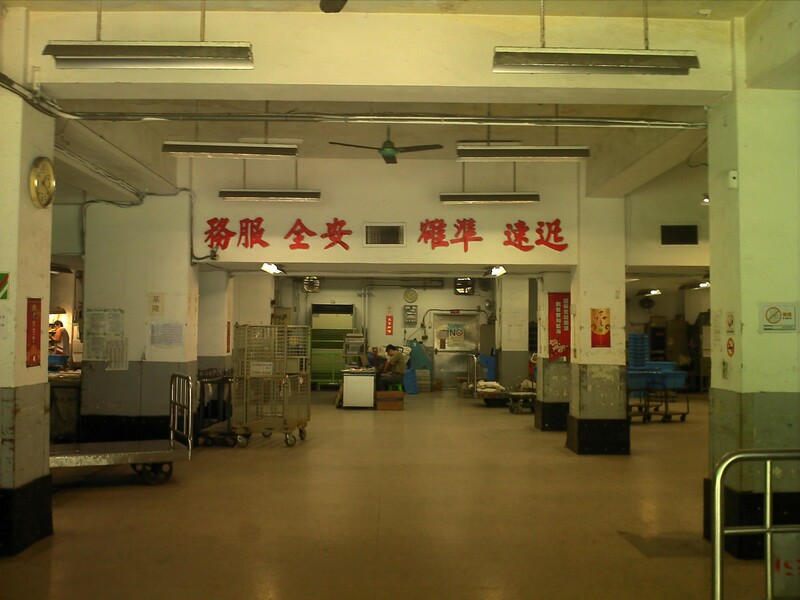 Taipei Post Office (台北郵局), also known as Taipei Beimen Post Office (台北北門郵局) was the agreed-upon spot and as I had some document signing and mailing of my own to conduct, there was nothing particulalry out of the ordinary about this location as a rendezvous. Once we were done, Bede whisked me around the corner from the entrance on Boai Rd (博愛路) and under the arches on Zhongxiao (忠孝). It was only then I realised we were going to dine inside the post office itself. Bravo! To enter, we had to leave our ARC cards with the security guard, though Bede says this was not required on his previous visit (yes – he’s something of regular). Almost as wide as he was high, the custodian grunted what I think was approval as we handed over the ID cards. 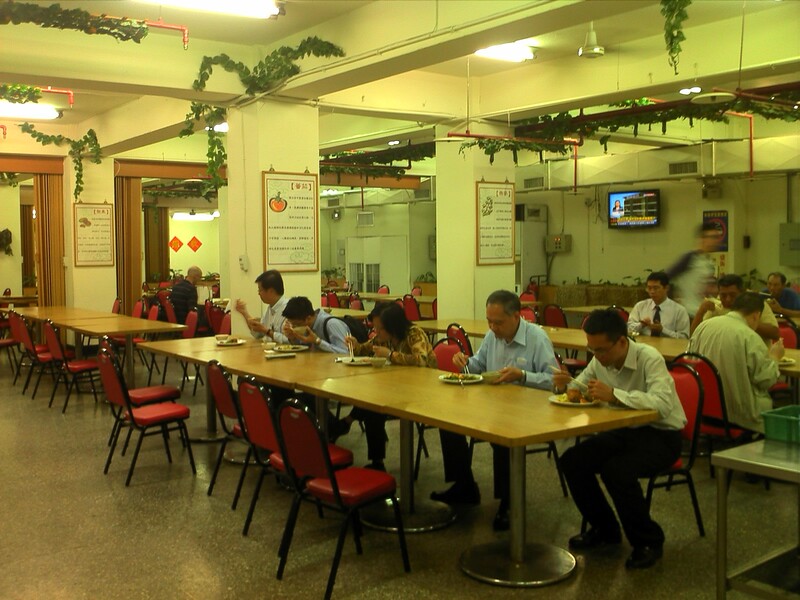 TV dinners: Chunghwa’s employees get stuck in. We made our way across the parking lot and past the loading area, then down into the canteen, where about a dozen employees sat at tables, eyes flitting between their plates and several large TV monitors on the walls of both sides of the hall. A couple of faces tilted in our direction, something approaching mild bewilderment flickering across them before they turned back to more important matters on the afternoon news. Let’s make no bones about it – something that cannot be said of the chef behind the rather unmeaty meat portion in my meal – Chunghwa Post won’t be winning Michelin stars any time soon – but at NT$50 for three vegetable portions and one meat, you’d be a bit cheeky to grumble. Plus there’s unlimited soup (miso when we there) and rice – white and the healthier purple grain stuff. Next time I’d plump for the fried chicken breast rather than the sweet-and-sour pork (nice sauce but, as I said, feeble). The loading/unpacking type area. Speed, safety and service are trumpeted on the sign. But the level of grub on offer is beside the point. While pensioners, labourers and those trying to scrimp and save take advantage of the canteen out of pecuniary considerations, we were just loving the unmistakably Taiwanese quirkiness of it all. 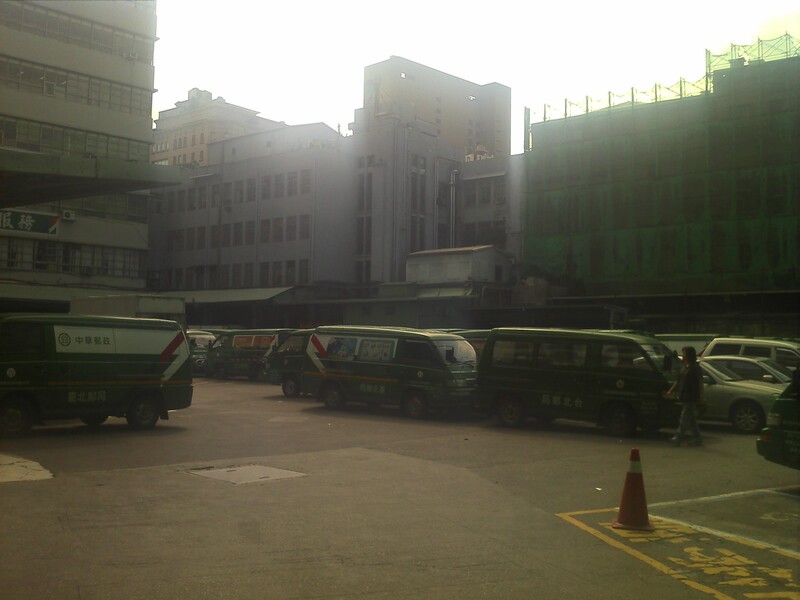 Through the arch: Chunghwa’s vans wait in the car park. I was admonished for taking this pic by a security busybody. Quite so. 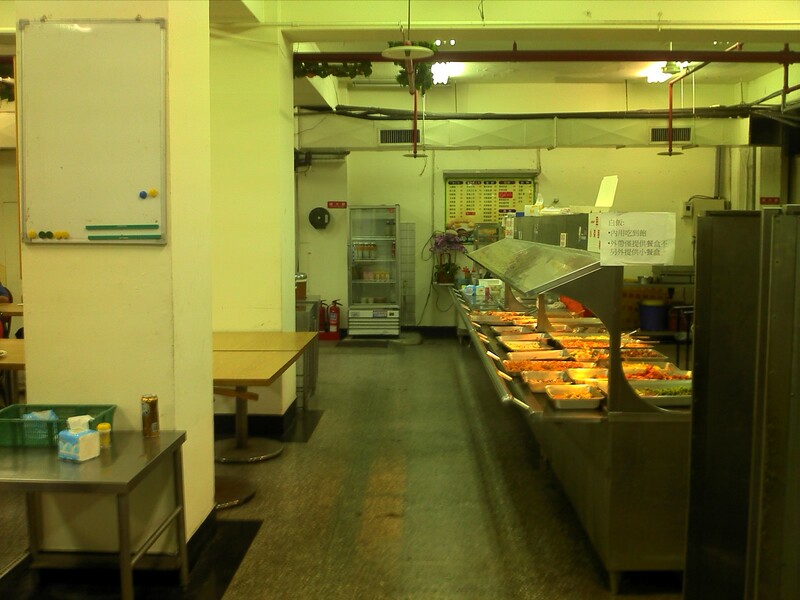 Office canteens are certainly common, but this one was a joy. I suspect it might have something to do with all the machinery. What’s up wiv the Eggspanyo’ Carter? Latino influence in LA or you just adding another string to your polyglottal bow? And who’s that hombre el suspicion skulking around in the back of the TV dinner pic?